Head coach Kermit Davis and the Ole Miss Rebels escaped The Pavilion with a win against the Texas A&M Aggies on Wednesday night. The Rebels snapped a four-game losing streak with the 75-71 over the 8-13 Aggies. Breein Tyree led the Rebels with 22 points, going 7-15 from the field and 5-5 from the free throw line. Terence Davis was the spark that led a comeback, finishing with 19 points, eight rebounds and seven steals. The SEC matchup against the Aggies was a must-win for the Rebels to keep hope alive for a run in the postseason. Ole Miss got off to a hot start with a 9-0 run to gain a 19-6 lead. Tyree snagged a steal from Jay Jay Chandler on the first possession and hung on the rim after a two-handed slam. On the next possession, Devontae Shuler found space on a crossover and drained a three from the top of the key. The Rebels controlled the game in the beginning until the Aggies used a 12-2 run to cut the lead to three with four minutes left in the first half. Texas A&M finished the first half on fire behind Brandon Mahan, only trailing by one heading into the locker room. Going into the second half, the story was the same for the Rebels. Texas A&M was simply making their open shots when Ole Miss was not. The Rebels went 1-7 from the field while the Aggies went 7-8. The Aggies continued to get easy buckets in the paint. Josh Nebo finished with 10 rebounds, most of which came over Dominik Olejniczak and Bruce Stevens. The Rebels came storming back to within one point with six minutes left after two steals from Terence Davis and a pull up three from Tyree. 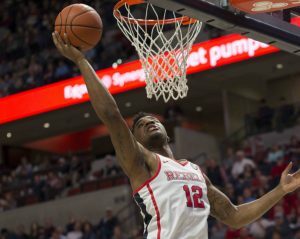 The Rebels rode that momentum down the stretch to keep the Aggies at bay. The play that sealed the game came with less than a minute left to play when the Rebels were up by three. Blake Hinson came up with a big hustle play to save a missed shot from going out of bounds, throwing it back into play where Terence Davis came up with it and was fouled instantly. Terence Davis hit both free throws to push the lead to five, and the Rebels never looked back. Rebounding and hustle plays had been a big problem for Ole Miss during their losing streak, but the forwards were able to produce enough to hold on to the lead late in the game. The Rebels still need to find an answer down low as they enter the final stretch of the season. An improvement in production can complement the backcourt being led by Terence Davis, that seems to have found a spark. The Rebels will look to keep the momentum going when they travel to Athens for a game against Georgia this Saturday.